The driver was thrown from the bike when the motorcycle overturned. 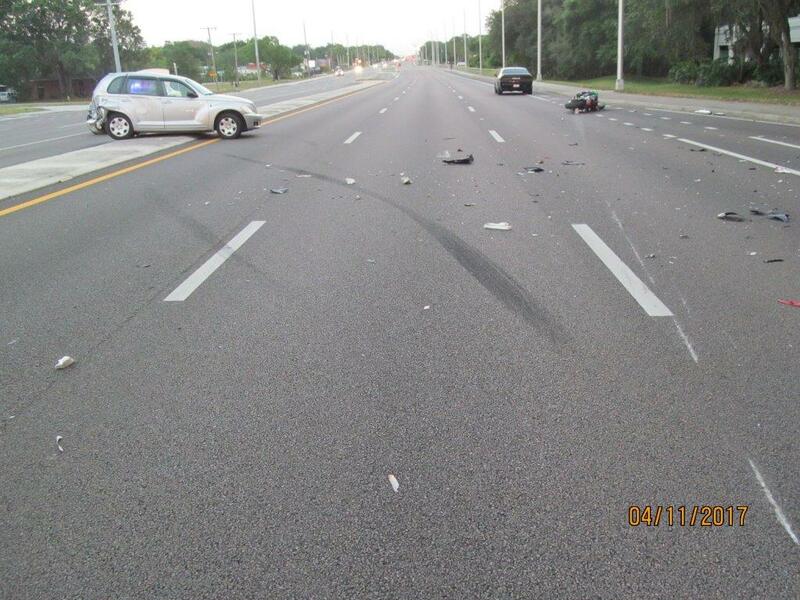 HILLSBOROUGH COUNTY – A motorcycle driver is in critical condition after a traffic collision Tuesday (April 11), the Florida Highway Patrol said. Joxel Lozada-Flores, 27, of Tampa, was taken to Tampa General Hospital with critical injuries. The other driver was not injured. The crash happened about 6:33 p.m. at State Road 574 and Riga Boulevard. Troopers said a 2006 Chrysler PT Cruiser driven by Douglas Maine, Jr., 49, of Spring Hill, turned east onto SR 574 from Riga and changed lanes into the path of a 2012 Suzuki GSX 1300 driven by Lozada-Flores. The Suzuki collided with the rear of the Chrysler and overturned, throwing Lozada-Flores from the bike.